Discussion in 'Developments in Amaravati' started by satish, Jun 17, 2015. It may be recalled, municipal administration minister P Narayana in his visit to China and Malaysia in the month of July, has personally inspected various transport systems available in those countries, which included electrical, mono, magnetic, light metro and heavy metro trains and briefed the Chief Minister on their feasibility in Vijayawada.According to officials of Amaravati Metro Rail Corporation (AMRC) the passenger traffic in Vijayawada is less compare to other metropolitan cities like Chennai, Bangalore, Mumbai, Kolkata and even Hyderabad. In Vijayawada about 6,400 passengers are travelling in various modes of transport per hour. Light Metro Rail can transport about 40,000 passengers per hour while Heavy Metro Rail can transport about 80,000 passengers per hour. Where as Vijayawada’s present population is about 12 lakhs, while the other cities, which are presently using metro rail services over one crore population.The German experts team in its report suggested that the first route will be from Nidamanuru to Pandit Nehru Bus Station (PNBS), a distance of 13.27 km and the second route will be from Penamaluru to PNBS, a distance of 12.76 km, for which about 26 km track will be constructed. They also suggested that the track can be extended to Gannavaram Airport in future.According to a senior official of AMRC, Light Rail Technology(LRT) is the only best option for the present traffic situation in Vijayawada, which will have less burden on the government too. “LRT is more flexible and profitable than the metro system and it is one of the most avant-garde technologies operating in Germany and France, he said.“LRT will have two to six compartments, which will run at a speed of 36 km per hour. In Europe about 287 LRTs are being operated by those governments. In our country LRT is being operated in Gurgaon of Haryana. LRT is feasible for Vijayawada, where the population is increasing day by day after it was declared state Capital,” he added.Chief Minister is also envisaging that every person in the city must travel a maximum of 30 minutes to reach their regular destinations and the transportation system must be efficient and pollution free, the official said. State looks to German firm to draw up project report for NMT. The Delhi Metro has been insisting upon the AP government to pay around Rs 60 crore due to them as part of the agreement to build Amaravati Metro. Vijayawada: The Delhi Metro has been insisting upon the AP government to pay around Rs 60 crore due to them as part of the agreement to build Amaravati Metro. Mr Ramakrishna Reddy, managing director of the Amaravati Metro Rail Corporation, stated that they had paid Rs 15 crore so far to the Delhi Metro Rail Corporation. "The Delhi Metro was selected as consultant on nomination basis. Before I joined AMRC, it was paid Rs 10 crore as advance, and Rs 5 crore after I became MD,” he said. As per the agreement, the AMRC has to pay about Rs 59 crore to its Delhi counterpart, the MD said “Since the Delhi Metro has not done anything in the past 10 months, the question of paying them anything more does not arise,” Mr Ramakrishna Reddy said. He said he would not allow funds to be spent to pay Delhi Metro for not doing any work. :We will pay the Delhi Metro only the actuals,” he said. Speaking on the appointment of Urban Mass Transit Company Limited as consultant to prepare a detailed project report for the non-motorised transport project (to make space for pedestrians, cycles) and integrated public transport plan for Vija-yawada Metro, he said the company would conduct studies only, and it might take around 6 to 8 months for them to complete it. Urban Mass Transit Company Limited is formed by the Union urban development ministry, the state government and In-frastructure Leasing and Financial Services Ltd. The Trans Oriented Development work also has been awarded to the UMTCL, according to the Mr Ramakrishna Reddy. He added that they were in consultation with the KFW of Germany for preparing the detailed project report for the non-motorised transport project. He said the role of UMTCL would be confined to studies on NMT and IPT. Keeping all these developments into consideration, a bureaucrat of the state government’s urban development department said the NMT might not take off before January 2019. “It will not be possible for the government to announce IMT, after 2019 January, as it would be an election year,” he said. Amaravati: Amaravati Metro Rail Corporation Ltd (AMRCL) has decided to invite tenders for preparing detailed project report (DPR) for mass rapid transport system in Vijayawada. The AMRCL may issue tender notice on August 25 and the deadline may be August 28. Sources said German agency Richard Ellert will act as tender agent. The objective of the specific project is to introduce an integrated and environment-friendly light metro/light rail system in Vijayawada. The light metro system would be comprised two corridors (26 km) and additional extension of 5 km to Gannavaram airport. The DPR should be included details on financial and economic viability of the project, including estimation of Financial Internal Rate of Return (FIRR) and Economic Internal Rate of Return (EIRR). The DPR should be prepared within the duration of approximately four months. A feasibility report has already been prepared for Vijayawada Light Metro and submitted to State government by Australian expert Edward Dotson. Amaravati Metro Rail Corporation (AMRC) principal advisor E. Sreedharan told Chief Secretary Dinesh Kumar in a meeting here on Thursday that he would try to get the proposed metro rail project in Vijayawada approved by the Central government. Mr. Sreedharan said he would discuss the project with the officials concerned in the Central government to obtain necessary clearances. He brought to Mr. Kumar’s notice that Amaravati and Thiruvananthapuram metro rail projects were pending with the Centre. AMRC Managing Director N.P. Ramakrishna Reddy, Project Director D. Radhakrishna, Principal Secretary (Municipal Administration and Urban Development) Karikal Valaven and others were present. Earlier, Mr. Sreedharan met Chief Minister N. Chandrababu Naidu and discussed the project status against the backdrop of the new metro rail policy that was unveiled by the Central government recently. Amaravati Metro Rail Corporation Limited (AMRCL) Managing Director N.P. Ramakrishna Reddy said on Thursday the government had decided to construct a Light Metro and extend the corridors up to the Gannavaram airport, Krishna Canal Junction and Jakkampudi. He clarified in a press release that though the Delhi Metro Rail Corporation (DMRC), which prepared the Detailed Project Report (DPR), felt that Light Metro was adequate as per the Peak Hour Passenger Per Direction (PHPDT) norm and other criteria, it recommended a Medium Metro assuming that the city had been planned to be developed as the capital city. The government had then submitted the DPR to the Ministry of Urban Development (MoUD) in June 2015 requesting permission to get the project executed by the DMRC on a turn-key basis. As per the DPR, the expected PHPDT was 6,366 by 2021-22 and the Financial Internal Rate of Return (FIRR) 3.47%. According to Mr. Reddy, the Ministry of Finance and the NITI Aayog observed that as per the National Urban Transport Policy (NUTP) of 2006, the PHPDT should be more than 20,000 for at least 5 km by 2021 and Vijayawada’s was not even 1/3rd of the requirement. The FIRR should be more than 8% whereas for Vijayawada metro it would be 3.47%. The Public Investment Board (PIB) of the Ministry of Finance kept its clearances in abeyance citing the deficiencies and the need to comply with the new policy. The MoUD then returned the DPR to Andhra Pradesh and requested it to resubmit the proposals. 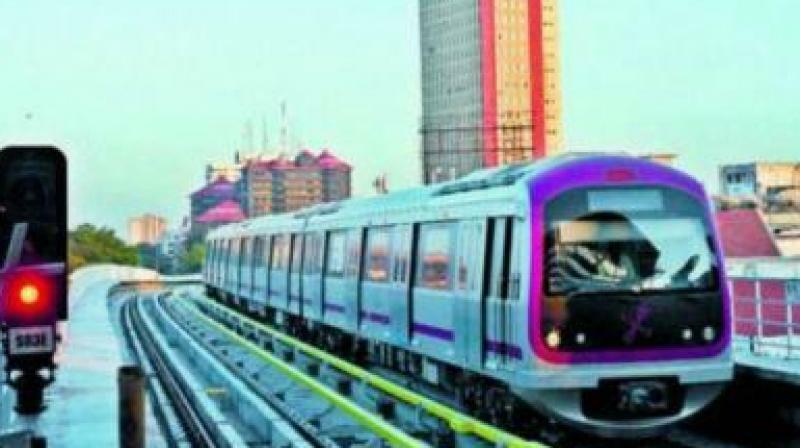 But, in anticipation of approval, the AMRC entered into an agreement with the DMRC on August 29, 2016, for execution of the Medium Metro project. Subsequently, a delegation led by Minister P. Narayana met the Union Minister, Secretary and OSD of the Ministry of Housing and Urban Affairs on September 15, 2017, and sought approval for the Vijayawada metro as per the old policy as it had given in-principle approval for it. But the Ministry officials suggested alternative systems like Light Metro/LRT. Hence the decision to go for Light Metro. As there had been no progress, the DMRC suggested closure of the contract/agreement with mutual consent and the AMRC had accepted it on October 4, 2017. The German development bank KfW is now in the process of getting a fresh DPR for Light Metro prepared by internationally reputed consultants. The Vijayawada metro, which has been in a limbo, gained impetus with the Steering Committee, constituted for the project execution, finalising the preliminary structure of the project. Vijayawada: A committee led by municipal administration P Narayana on Thursday recommended Light Metro Rail system and elevated corridor for all 77 km lines as part of Amaravati Metro Rail project after discussing various transport options. The Vijayawada metro, which has been in a limbo, gained impetus with the Steering Committee, constituted for the project execution, finalising the preliminarily structure of the project. The meeting recommended corridor from KC canal junction to Amaravati capital city with 27 km with both Elevated and Underground options. The minister also suggested that to officials to study the advantages and disadvantages of both options of taking the corridor. The matter will finalised after discussion with Chief Minister next week. Of the four options proposed by the consultants preparing the Detailed Project Report (DPR) of the metro rail, the Steering Committee told the Amaravati Metro Rail Corporation (AMRC) to go ahead with an elevated light metro system. The project has been proposed in three corridors in and around Vijayawada with a total length of 77 km. In the committee meeting held on Thursday, Municipal Minister P Narayana suggested that the consultant — Systra Consultants — examine the extension of one of the corridors to Amaravati. According to the interim DPR submitted by Systra, four options – At-grade, elevated, underground, and combination of elevated and underground – were suggested. It also suggested that the State government could go with Light Rail Transit (LRT) or Light Metro. “The committee examined the phase-A of the DPR submitted on October 25 and suggested to go for Light Metro system and Elevated corridor for all 77.2 km of corridors,” a press release from Minister Narayana’s office said. Narayana is the chairman of the Steering Committee. The three corridors proposed by the consultants include Amaravati – Pandit Nehru Bus Station (PNBS) – Nidamanuru-Gannavaram (52 km), PNBS – Penamaluru (12.5 km) and Railway Station – Jakkampudi (12.2 km). According to the press release, Minister Narayana, on the occasion, suggested the inclusion of cost estimates for the corridor from Krishna Canal (KC) junction to Amaravati Capital city – about 27 km – with both options of the elevated and underground metro. “Minister Narayana also suggested that a study is conducted on the advantages and disadvantages of having an underground line near the airport while the remaining corridors would be elevated,” the press release said.